Unless you were the son of a king, the hardest job to get in the Middle Ages was to become a king. Even if you were shrewd and had the backing of a strong army, the chances of successfully seizing the throne were often very low. Yet, in 1135 a nobleman named Stephen of Blois was able to become the King of England. Here is the story of his success. The opportunity to become a king only comes when the current king is either incapable or dies without someone to inherit his domain. The latter was the situation that faced England when King Henry I passed away in 1135, Henry had ruled England for 35 years and Normandy for almost as long, and had a reputation for being a strong, some would say tyrannical, ruler. ones) – William and Matilda. When William died during the tragic Sinking of the White Ship in 1120, Henry attempted to name his daughter Matilda as his successor. A political alliance was arranged through her marriage to Geoffrey V, Count of Anjou, one of Henry’s rivals, and then Henry made his leading nobles swear an oath that only daughter would inherit the crown him after he died. On December 1st, about a week after he fell ill, Henry died. Fear gripped both England and Normandy, and as not only did local uprisings take place, but news soon arrived that the Welsh and Scots were marching their armies into England. People were looking to have a ruler installed immediately. Into this confusion stepped in Stephen of Blois, Count of Boulogne. Stephen was a nephew of King Henry – his mother Adela was Henry’s sister – and he was regarded as competent member of the Norman nobility. Over the years Henry had treated him well, bestowing on Stephen lands and lordships, but he had never thought of naming Stephen as a potential heir. Among the many reasons against this idea was that Stephen had an older brother named Theobald, who would have had a better claim to any throne. As word spread of Henry’s death, Theobald and the other leading nobles in Normandy decided to take a cautious approach. The first matter was to make sure that Henry received a proper burial. Then they wanted to meet and settle who would become their next King. Although they had all sworn to support Matilda, the nobles never wanted a woman to be their new ruler. Moreover, they distrusted Geoffrey and the Angevins. Instead they would settle the issue of succession themselves, presumably through negotiation and bargaining. There was only one noble who thought otherwise – as soon as Stephen heard of Henry’s death he immediately set sail for England with a few of his supporters, a sea crossing that would have had some danger in the cold days of December. But the Count of Boulogne was determined to enact his plan as quickly as possible, before any of his rivals new what was happening. journeyed hastily to London, the capital, the queen of the whole kingdom. At his arrival the town was immediately filled with excitement and came to meet him with acclamation, and whereas it had been sadly mourning the previous death of its protector Henry, it revelled in exultant joy as though it had recovered him in Stephen. So the elders and those most shrewd in counsel summoned an assembly, and taking prudent forethought for the state of the kingdom, on their own initiative, they agreed unanimously to choose a king. For, they said, every kingdom was exposed to calamities from ill fortune when a representative of the whole government and a fount of justice was lacking. Stephen realized something that no other potential contender to the English throne realized – if one wanted to rule England he had to gain London. His timing was great too, as the Londoners wanted to have to a king as soon as possible. They claimed it was their right to elect their own king, but Stephen was the only candidate presenting himself, making their decision all the more easier. With a mixed body of peasants and mercenaries, harassing his neighbours in every direction, he made himself unendurable to all, sometimes by insatiable pillage, sometimes by fire and sword. At length Stephen met him with spirit and after triumphantly capturing some of his followers either deprived of them of their lives or put them in chains; and shutting up their leader himself together with others he finally hanged him on a gallows. Stephen’s quick victory showed that he was a capable leader who would act decisively to defeat a threat. He has also chosen an opponent that was not much of a challenge – a minor official and a band of rogues. Stephen could have decided that he had to fight against Matilda, or march off to the borders to confront the Welsh or Scots, but that would have been a much more riskier enterprise. He was fighting only battles that he was sure to win. Henry had been dead less than two week, but Stephen was now heading to the city of Winchester for the next phase of his plan. Here his brother Henry was serving as the Bishop and according to many of contemporary chroniclers he was very influential in carrying out Stephen’s scheme. Besides giving him a warm welcome to Winchester, Henry had been busy trying to convince or bribe the man who had control over Henry’s treasury – William de Pont de l’Arche. Once Stephen arrived William gave him the keys to the treasure, giving him access to all of Henry’s accumulated wealth. When reports spread through the kingdom of the tidings of the new king’s arrival, a great many, and those especially who before his accession had bound themselves in friendship to him or his brothers, receiving him with joy and jubilation, followed his lead with all their efforts. which dispersed through the province round about, committed outages, violated churches and cemeteries, oppressed the peasants, and repaid those who had received them kindly with many injuries and wrongs. After the Normans, who are innately warlike and bold, had realized that the crimes of their guests were stirring up trouble, they too took up arms in their anger and pursued them through villages and woods and, is commonly alleged, put more than seven hundred to death with fire and sword.The remainder, terrified by the bloody assaults of the Normans, fled with dishonor back to their own country and, nobles of the oath and had even picked Stephen after being severely punished by the sharp swords of the Normans, made no further attempt to repeat the experience for the time being. become the next king, seemingly unaware that back in England Stephen was already completing his plan to take the throne. The final phase in his plan was to get approval from the religious establishment, most notably from the Archbishop of Canterbury, the leading churchman in England. The archbishop was wary of supporting Stephen’s claim, reminding everyone of the oath that he and other nobles had made years earlier to support Matilda so that she could become the next ruler. Stephen’s supporters argued that King Henry had forced them them take that oath, making it invalid. Others claimed that on his deathbed Henry had absolved his nobles of the oath and had even picked Stephen to be the new king instead. Besides these arguments, Stephen had another card to play – he was promising the Church many benefits and rewards for their support. Basically this was bribery, and Stephen was willing to make any agreement. Afterwards he would renege on many of his promises, but for the immediate future he was presenting himself as the best friend to the Church. The archbishop was soon convinced that Stephen was the best man for the job. On December 21st, Theobald and the other Norman leadership met to discuss the succession issue. Theobald was confident that they would choose him to be the next King. However, shocking news arrived during the meeting – Stephen was to be crowned the next day at Westminster Abbey. The Norman nobles were astonished, and in the end they did not want to risk having England and Normandy split up or fall into war. They accepted the fait accompli that Stephen had orchestrated. 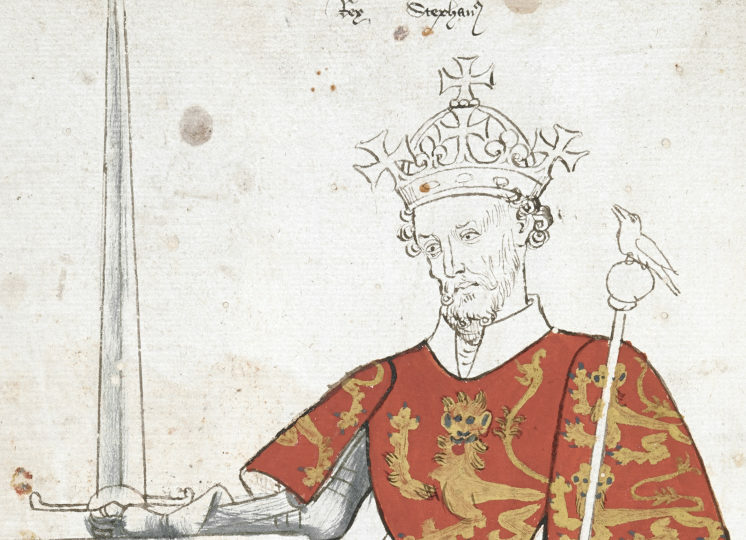 On December 22nd, three weeks after Henry I died, Stephen was crowned at Westminster Abbey. He had taken advantage of an opportunity and acted when nobody else did. It is also clear that this was something that he had planned in advance – perhaps for years – working with his brother the Bishop of Winchester to secure the elements needed to aspire to the kingdom. See also: Was the White Ship disaster mass murder? This article was first published in The Medieval Magazine – a monthly digital magazine that tells the story of the Middle Ages. Learn how to subscribe by visiting their website.